Lightweight formula that nourishes hair without weighing it down. With Botanic Oil + Collagen. It helps keep hair's natural volume. With Oxyfusion technology, the formula delivers weightless nourishment. Rebalances biological changes, for a more voluminous hair. It breathes life into flat hair, for 95% more volume*. Daily use conditioner. For best results use with the full Dove Volume Amplified range. If you have fine, limp hair, it can be difficult to find a conditioner that moisturises and nourishes your hair without weighing it down with too much product. You might even have avoided using a conditioner for fine, thinning hair, and found that this dries your hair out. That?s where Dove Advanced Hair Series Volume Amplified volumising conditioner comes in. Forming part of the Dove Advanced Hair Series range, it?s Dove?s moisturising conditioner for thin hair, breathing life into fine, flat hair so you?ll no longer feel the need to skip this stage of your hair washing with Dove hair conditioner. Our Dove volume boost conditioner is formulated with a lightweight Oxyfusion formula to help rebalance the biological changes of flat, limp hair. Did you know? As hair goes through changes over time, it becomes thinner and less voluminous. Dove?s lightweight conditioner has a lightweight formula with a blend of Botanic Oils, Collagen and Oxyfusion technology. 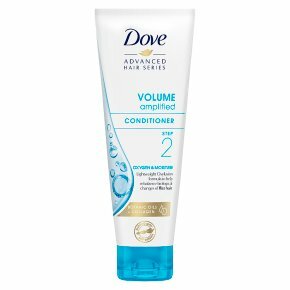 It breathes life into flat hair, for 95% more volume*, and that?s why you need this Dove conditioner. With Botanic Oils + Collagen for hair, it helps keep hair's natural volume and delivers weightless nourishment. How to use: Apply to mid lengths and ends of wet hair and rinse. Daily use conditioner. For best results use with the full Dove Volume Amplified range. * Versus flat limp hair.